Bjarne Nielsen the owner and the founder of bjarne pipes. After a MBA degree from the University of Copenhagen and a career in the Danish Foreign Service the company was founded in 1973 and it is probably Denmark's largest pipe manufacturer of 100% hand made pipes. 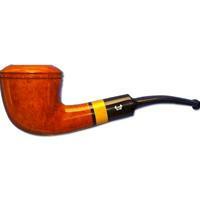 Each pipe is formed on a lathe and as a consequence, there are no model numbers. Each and every pipe is totally hand made and individual, but if a customer likes a particular shape it can be "copied", rendering them about 95% identical.